Salad Creations Canada: Is this McSalad bar an unintentional FranWhack? Some imported franchise systems are designed to fail: to make the CDN franchisor and all franchisees’ life savings evaporate. The U.S. franchisor comes in, terminates the much smaller CDN licensee and takes over the “x out of 50” stores that were promised under contract. This is how nice northern families can end up as cannon fodder. 100% well-meaning but, nonetheless, incompetent or incapable of going the distance. Since I have tremendous respect for the Toronto Star business journalists, I suspect #2 and not #1. Case in point, the Canadian launch of Salad Creations (one corporate location, zero franchises). 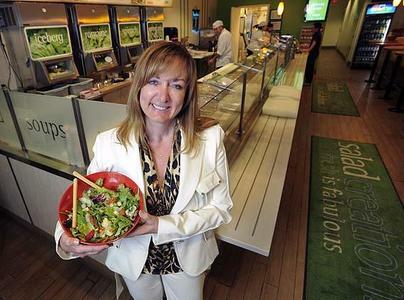 Lisa Wright interviews Brenda Bot, the franchisor in a story on the front page of the Business Section: Romaine Empire: Green through and through, Salad Creations aims to grow into nation’s Subway of salads. It takes industry and franchisor experience, adequate capital (very high burn rate, esp. in recession), a business model that has been successfully “transplanted” and a capacity to utilize network effects (exponentially increasing value as unit sales increase). I see none of these minimum prerequisites here. What I do see is a sincere person who naively believes that you can franchise any business concept and do it profitably for themselves and others. That a single one of a 5,000 Tim Hortons costs way over a million $ to build: yet Ms. Bot thinks she can launch a national chain for less than that? I also see (and this gives me zero joy to type) is another in a long line of U.S. born, CDN imported “FranWhack” franchise investment scams: hype masquerading as a business. These easily-duplicated, one-product business “opportunities”‘ are simply not investment-worthy in the opinion of Blue Maumau stalward, 45-year franchise industry expert, Richard Solomon. This concept was previously reviewed by me and I am of the opinion that, like Dagwood Sandwiches, Cereality and SoupMan, this should be considered a FranWhack franchise offering – one that will take every franchise investor down to bankruptcy. I suggest reviewing what is and is not a FranWhack franchise investment on his website, FranchiseRemedies.com. Get Smart and call Richard in Texas for yourself and ask him if Salad Creations sounds like a FranWhack. He won’t fill your head full with a bunch of phantom dreams as Toronto-based Michael Webster (The Psychology of Scams) so clearly defines. Don’t gamble with a Walter Mitty-esque longing to Be your own Boss, or Be in business for yourself not by yourself. You will never have fewer alternatives as when you are in a franchior:franchisee relationship. You and your spouse’s life savings may live to thank you. Ms. Bot draws the analogy between Salad Creations and Subway. This seems to be a twist on the hackneyed “next McDonald’s” huckster mantra so popular a few years ago. For franchise investors, Subway may leave a bitter taste because that system has had a singular reputation among industry experts. I wish Mr. & Mrs. Bot the very best in this new industry but that sentiment stops cold dead if it requires their their investors lose their life savings. They are green (green as grass? ), as the headline editor wryly implies. They have a problem (eg. too much money) and their new best friends (lawyers, consultants, association, banks, etc) will help them overcome. I’ll just add this article to WikiFranchise.org and check back in a few years to see how this newly minted CFA member and investors are doing. Odd how their U.S. site says they have franchisees in California but that there is no listing for Salad Creations on the Cal-EASI Database. I don’t do pre-sale due diligence consulting so I would defer to professionals like Solomon and Webster for those answers. Someone in the family should call me so I can explain how the CDN Krispy Kreme development deal went down. No charge to anyone calling as I have zero franchisor consulting clients, ever. This entry was posted on Monday, July 27th, 2009 at 4:27 pm and is filed under Opportunism, WikiFranchise.org. You can follow any responses to this entry through the RSS 2.0 feed. You can leave a response, or trackback from your own site. 6 Responses to Salad Creations Canada: Is this McSalad bar an unintentional FranWhack? Looks like they are closed for business… not surprised. Shame since she just bought a brand new mansion…… I guess the little guys have to foot the bill. Other company Nor Eng construction cut corners and was charged with a bridge collapse in Sudbury 2004. How do these scam artists continue to start new businesses. The next time you see the name Bot and franchise run. Looks like Bot maybe back in business, re-opening existing SC stores with new employees. Hope she pays them! What are chances of the former employees ever getting paid? Perhaps a few picketers at her locations would encourage her to pay what she owes. How do these people continue in business with such poor ethics? Last time I checked there was an Ontario Ministry of Labour. Don’t forget to send along the photos. “Hand in front of lens” stuff for sure.